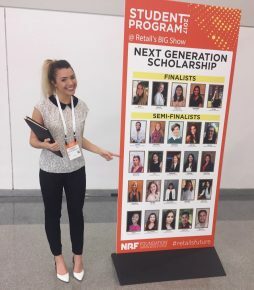 Savannah Kleiner ’17 had no idea what was in store for her as she headed to New York for the National Retail Federation’s Big Show, the annual showcase for retail merchants. But not only did she come away excited about her future, she was honored as one of 20 semifinalists for the federation’s Next Generation Scholarship, which supports college students pursuing careers or majors relevant to retail. Kleiner was one of 10 Butler students to make the trip, along with Kim Goad, Director of Career Development in Butler’s Lacy School of Business, and Eloise Paul, one of the Lacy School of Business’s career mentors. Paul, who worked in retail before switching to teaching midway through her career, recommended that Butler join the National Retail Federation and attend the Big Show as a way to show students the enormous variety of career options available to them in retail. The trip was funded by donors to the Lacy School of Business’s Experiential Fund and through NRF scholarships. In addition to Kleiner, Kelsey Kinniry ’19 (NRF Student Ambassador) and Macey O’Brien ’19 (NRF Rising Star) earned scholarships that paid for their expenses. "I'm so grateful that Eloise encouraged us to join the NRF, and so proud of our students,” Goad said. “They represented Butler well and made the most of four very full days. This opens up incredible opportunities for all of our majors and I look forward to growing the program." -Had dinner with Mel Tucker and Michael Wolkoff, CFO and Chief Merchandising Officer, respectively of the iconic New York store Century 21. Paul said they had “an engaging conversation about the retail industry and careers in retail, and a tour at their flagship store.” Mel is the husband of Butler alumna Edwina Tucker ‘88. -Heard from an array of speakers, including Neiman Marcus CEO Karen Katz; designer Rebecca Minkoff; a young professional panel with recent hires from Nike, the Home Depot, West Elm, Belk, and Kohls; College Relations executives from Macys, Kohls, Ross, Nordstrom, and Belk; and author/motivational speaker Simon Sinek, author of Start with Why: How Great Leaders Inspire Everyone to Take Action. -Learned that retail offers a broad range of career opportunities—not just fashion and not just sales. Paul said that the conference stressed the need for students in the STEM fields (science, technology, engineering, and math) who can crunch and interpret data. "We had people from California to New York City. There were more than 600 students from all across this country. So this was huge." Will Willoughby ’19 went to New York City in October with the Lacy School of Business, confident about pursuing a career in finance and banking. He came home convinced that he’s on the right career track. And then there’s Marissa Terando ’18, an accounting and finance double-major. She “learned so much at JPMorgan Chase about the investment banking industry and all the different sectors that make up the company” that she came away interested in working on the Foreign Exchange and Commodities desk. “Something I had never even heard of before this trip,” the junior from Carmel, Indiana, said. 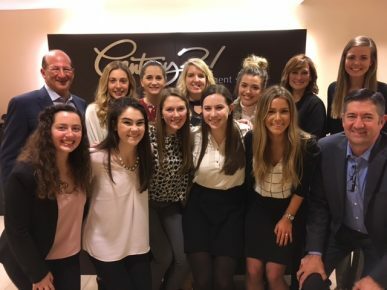 Willoughby and Terando were among eight students who took the Wall Street Trek trip to get a good look at Wall Street—JPMorgan Chase, the Stock Exchange, Blue Mountain Capital—and Johnson & Johnson headquarters in New Brunswick, New Jersey. At JPMorgan Chase, they met with Mike Bennett ’09, Vice President, Investment Specialist, and Eric Wiedelman, Managing Director, Global Securitized Products. Amy Wierenga ’01, Head of Risk Management, was their host at Blue Mountain Capital, and Francisco Miyares ’10, Senior Financial Analyst, met with the group at Johnson & Johnson. 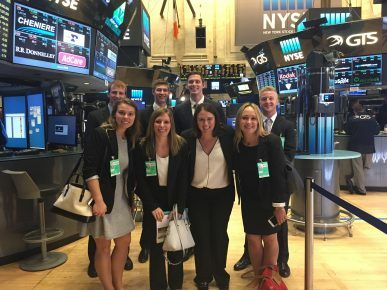 The idea of the Wall Street Trek, said Kim Goad, Director of Career Development in Butler’s Lacy School of Business, is to provide students with a deeper awareness of different roles in finance and a bit of a taste of what it might be like to work in New York City. “This is one of the best parts of my job—to be able to match students up and show them what a day in the life really looks like and to expose them to different opportunities,” said Goad, who chaperoned the trip along with Assistant Professor of Finance Bryan Foltice. Goad said the students chosen to participate in the two-day trip were required to submit a resume and cover letter. They had to have attained a certain grade-point average and make a compelling argument why this trip aligned with their career goals. Lacy School of Business donors have now paid for the trip for two consecutive years and have committed to continue funding an experiential fund. Goad said the Butler students made their benefactors proud. And in January, the Lacy School of Business will be going back to New York—this time with students interested in the retail world. From January 12-15, 10 students and two faculty members will attend Retail’s The Big Show, which features thousands of retailers—big box stores, fashion, technology, online, and others. They’ll have an opportunity to network with people, to have their resumes reviewed, and hear some great keynote speakers. 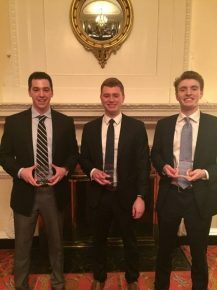 A team of five Butler University students won the Purdue University Parrish Library Case Competition held on Saturday, November 5, an annual contest that challenges students to use their business research skills to solve a problem for a company. 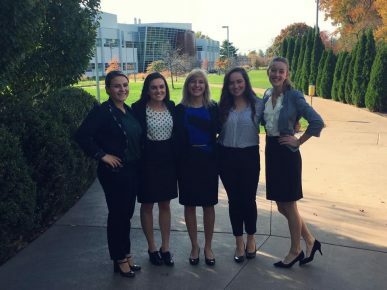 Sammie Chalmers, Taylor Gillenwater, Nicole Henrich, Karly Krebs, and Allison Wolff beat more than 20 teams from Indiana University and Purdue University in a competition that took place at the Burton Morgan Center for Entrepreneurship on the main campus of Purdue University in West Lafayette. Business Librarian Teresa Williams organized Butler's entry into the competition. Williams and Library Associate Andrew Welp, who also is an adjunct librarian supporting Butler’s Lacy School of Business, helped the team to prepare. As Information Commons students—student employees of the Information Commons, a collaborative program of the Butler Libraries and Center for Academic Technology—the Butler team members receive training in how to find, evaluate, use, and present information. Information Commons and eLearning Librarian Amanda Starkel and Academic Technology Specialist Megan Grady-Rutledge co-manage the Information Commons program and have developed a training program that provides a foundation for 21st century research skills. Participants in this year’s competition were asked to focus on a real startup, Alexandria Brewing Company of Alexandria, Kentucky. The students were asked to conduct research and provide a market analysis for the company. They were assigned to analyze the craft beer market nationally as well as locally in Ohio/Kentucky/Indiana to provide insights on the target customers, trend analysis, and action plan. The teams put together PowerPoint presentations and executive summaries. 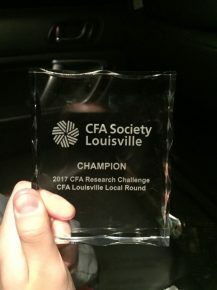 The judges complimented the Butler team for its information and presentation of data, its implementation plan and the way it connected its research to the company’s backstory.